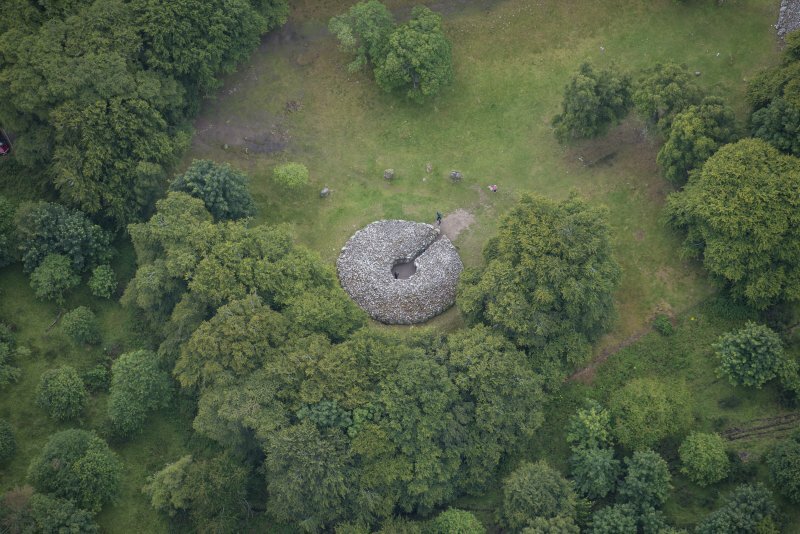 Oblique aerial view of Clava Cairns, looking ENE. 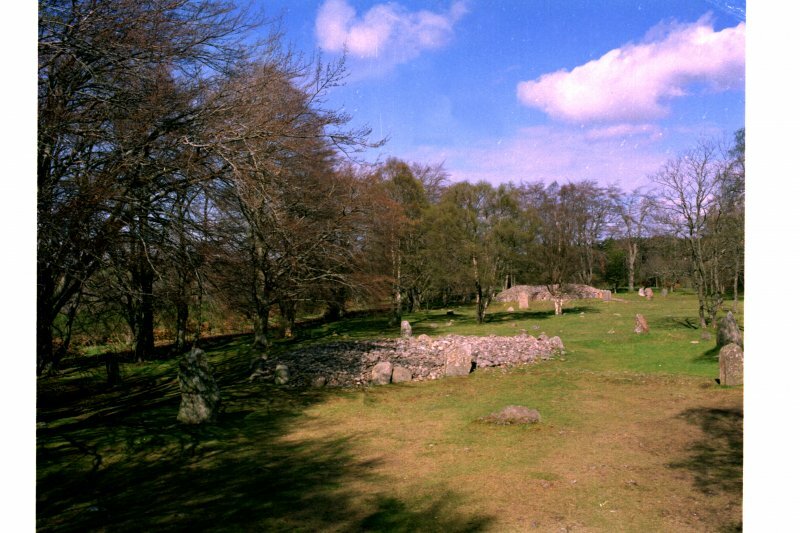 View of north-east cairn and stone circle. 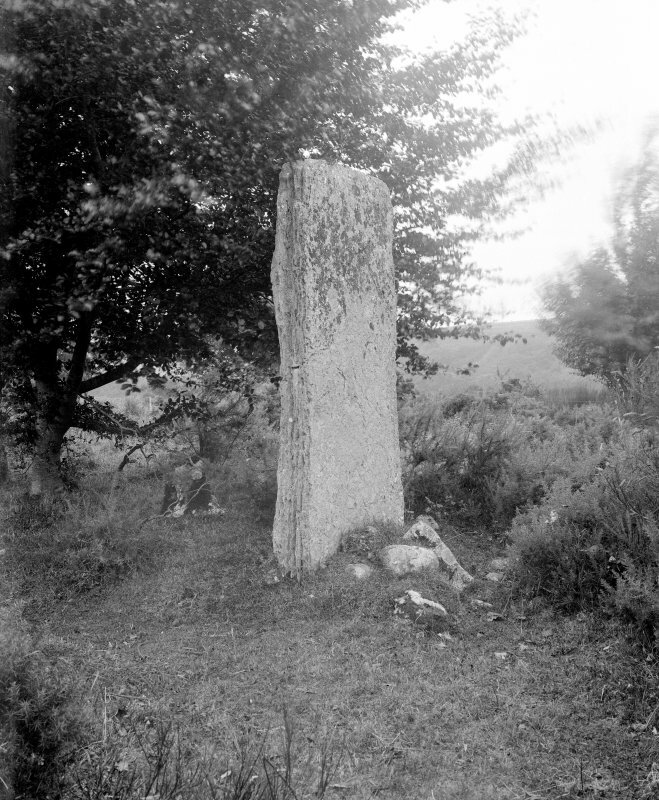 View of standing stone at north-east cairn. Excavation Photograph: Stone under excavation. 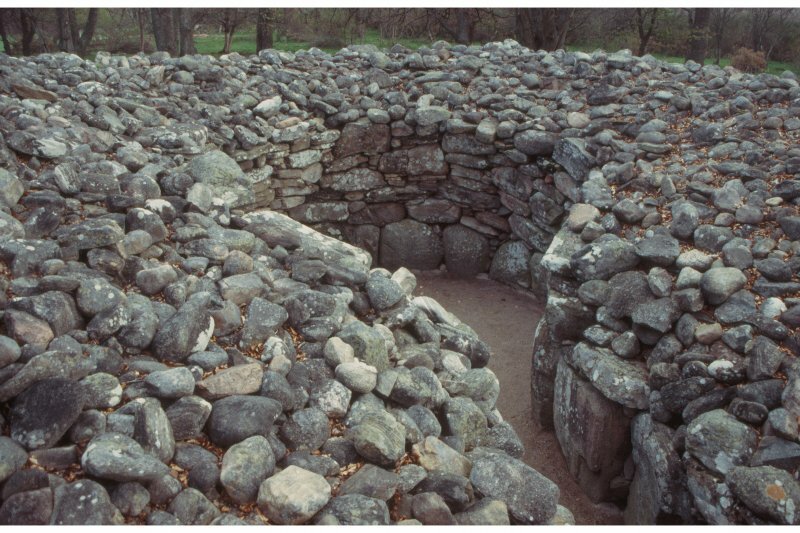 View of interior of north-east cairn. 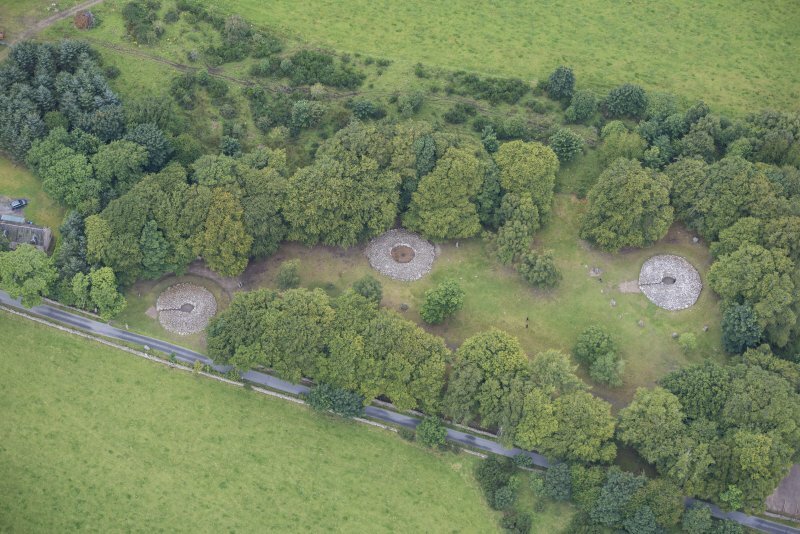 Oblique aerial view of Clava Cairns, looking NW. 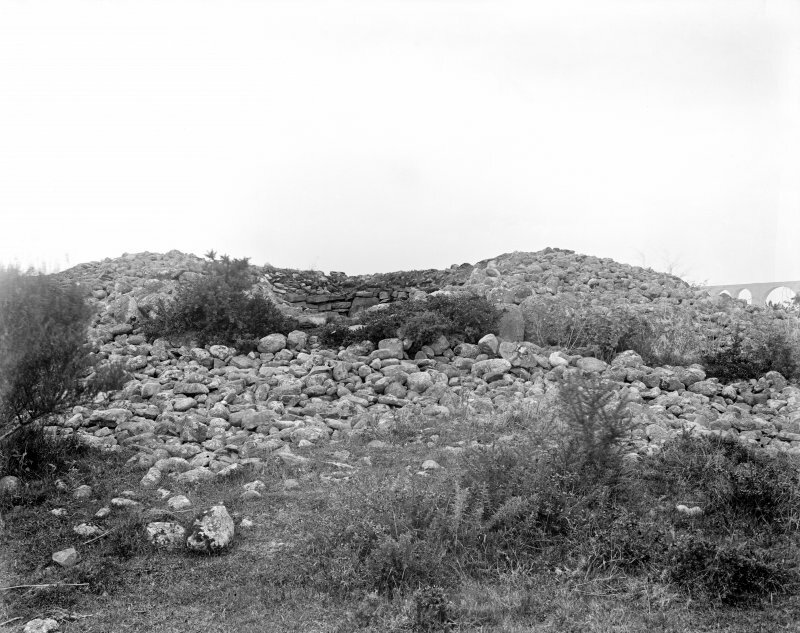 View of cairn from south-west. 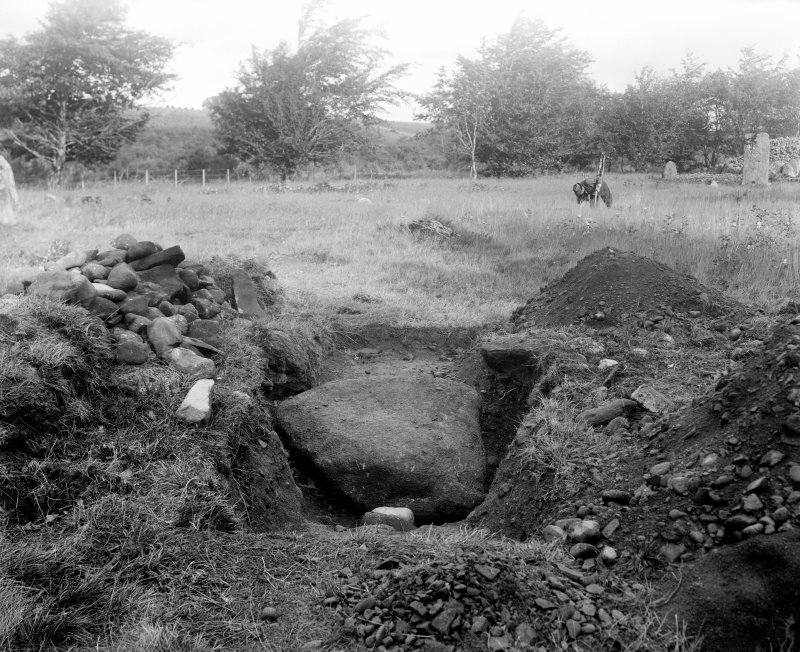 View showing the chamber of the NE passage-grave. 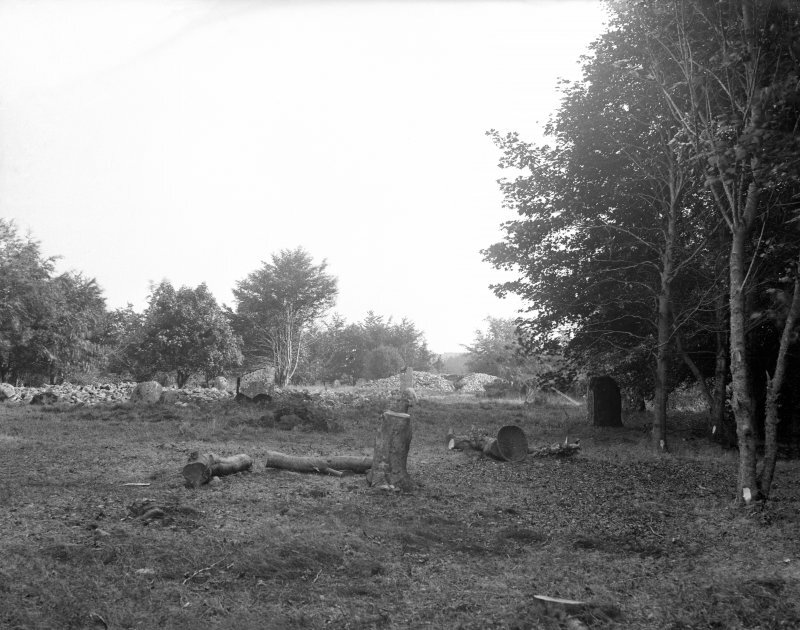 View showing the NE passage-grave. 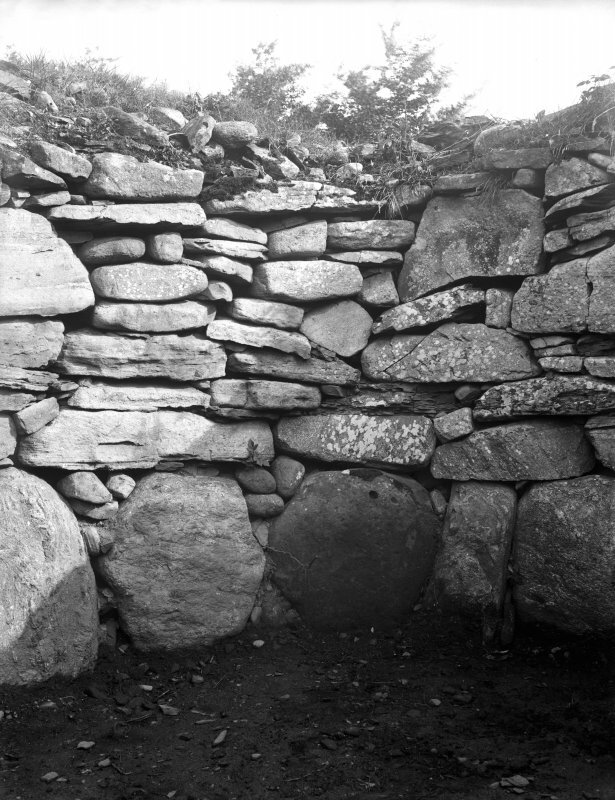 Detail of stones in north-east cairn interior. 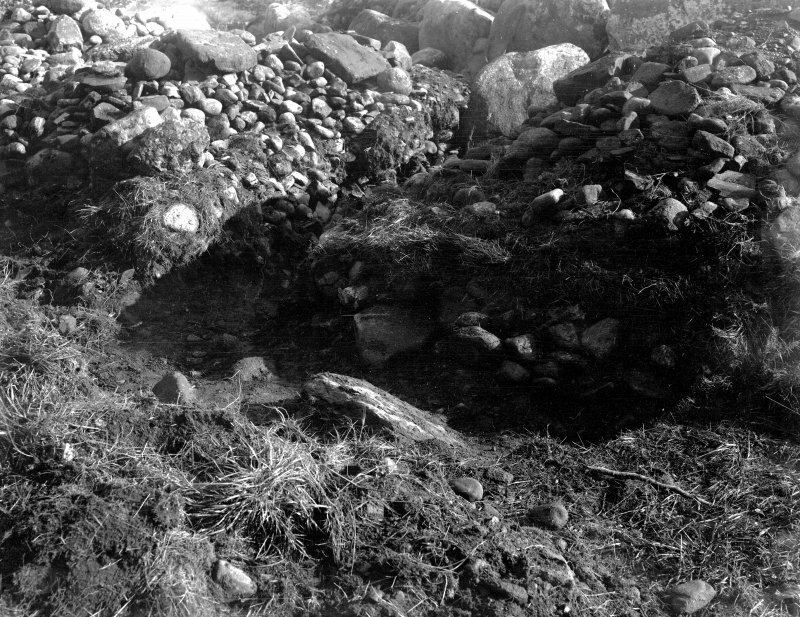 View of passage and interior of cairn. 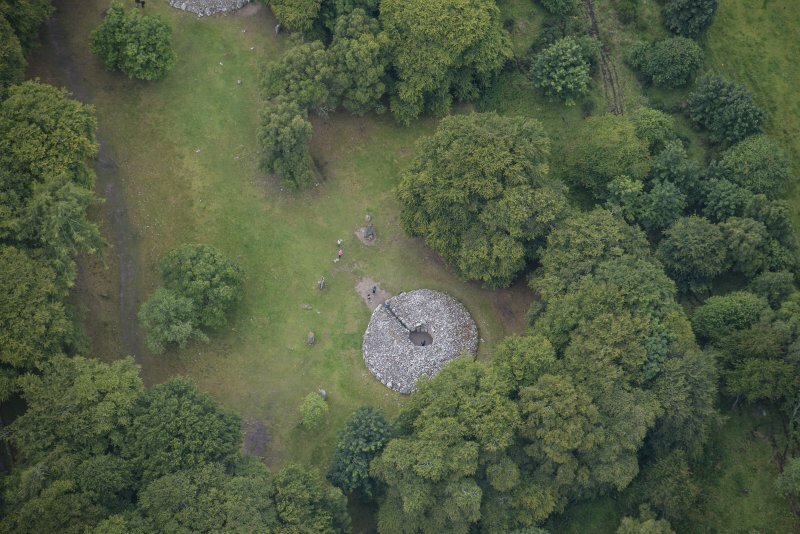 Oblique aerial view of Clava Cairns, looking NNW. 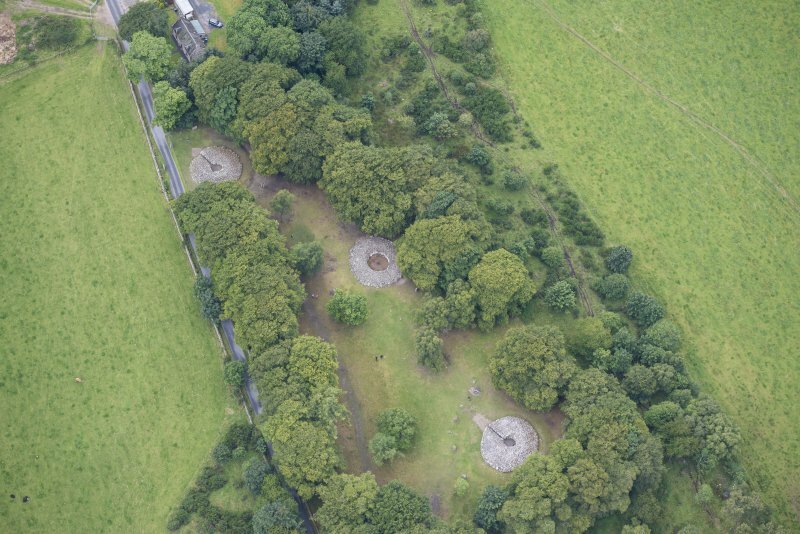 Oblique aerial view of Clava Cairns, looking N.
Oblique aerial view of Clava Cairns, looking NNE. Excavation plan and section MOW. Photographic copy of a drawing. 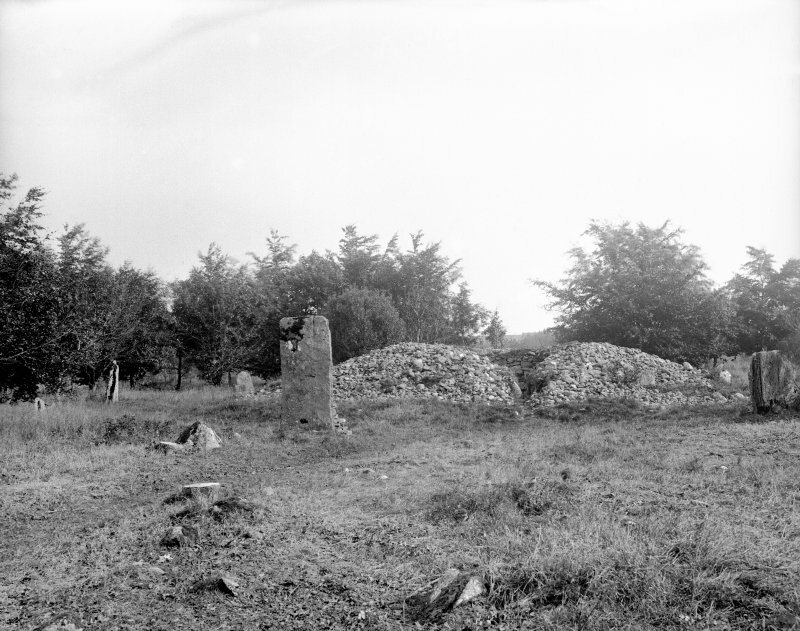 Photograph of colour drawing of the three cairns at Balnuaran. 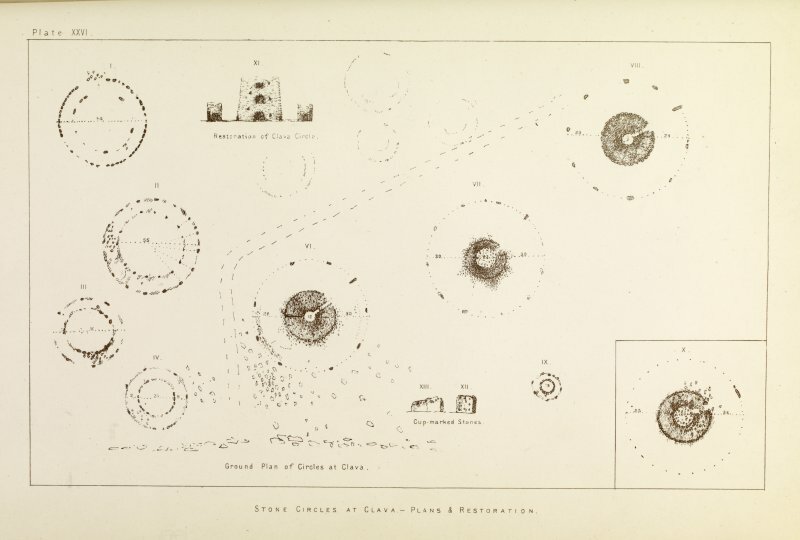 Oblique aerial view of Clava Cairns, looking E.
Plate XXVI, Christian Maclagan's1875 'The Hillforts, Stone Circles and other Structural Remains of Ancient Scotland'. 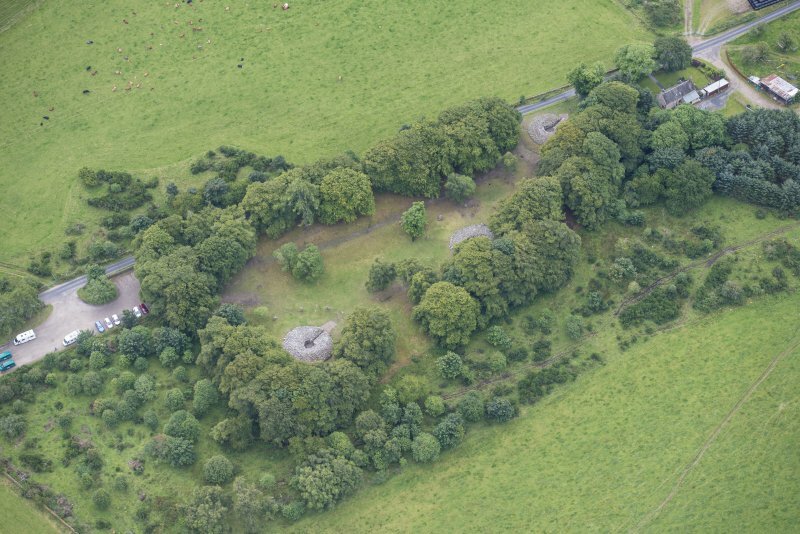 Oblique aerial view centred on the remains of the chambered cairns at Balnuaran of Clava with the farmstead adjacent, looking to the NE. 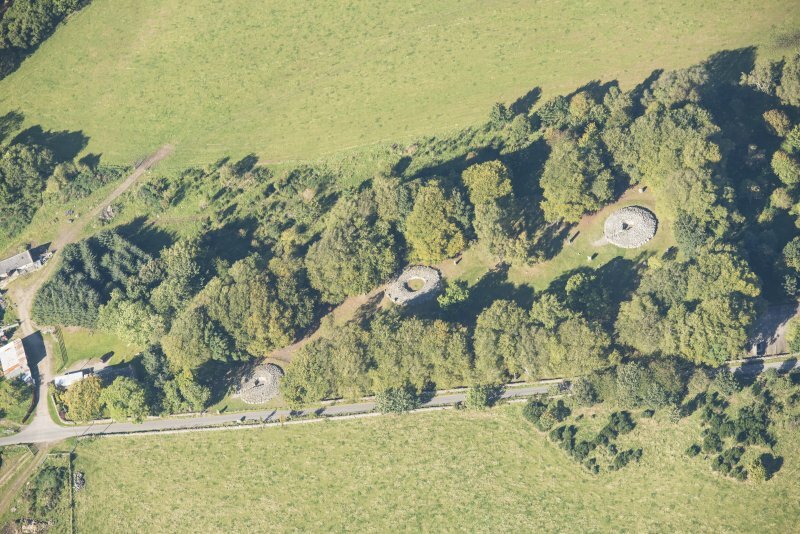 General view of the cairns. 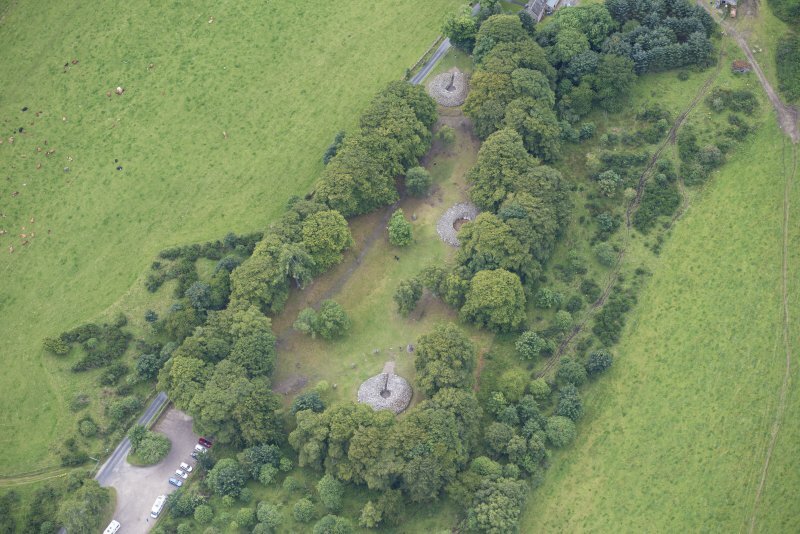 Centre cairn in foreground and North-east in distance. 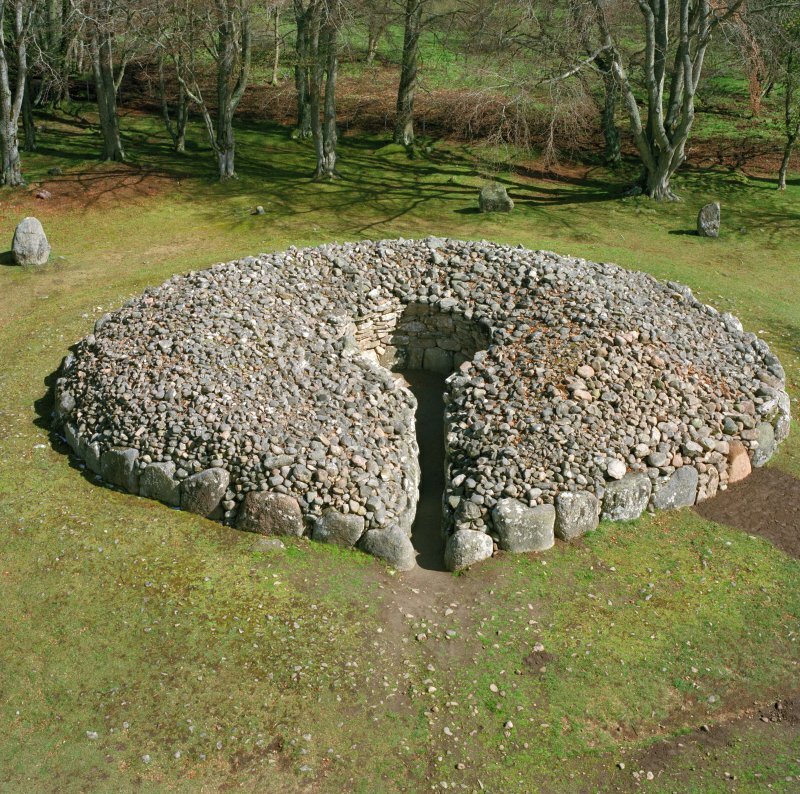 Clava passage-grave (Balnuaran of Clava, North-east) The cairn lies only 123 feet to the north-east of the central cairn, in the middle of the Clava cemetery. The kerb is of massive boulders and has a diameter of 55 feet. The stones graduate irregularly in size from 3 feet by the entrance on the south-west side to 1 foot 6 inches at the back, though the pair of stones which actually form the entrance are lower, 2 feet high. 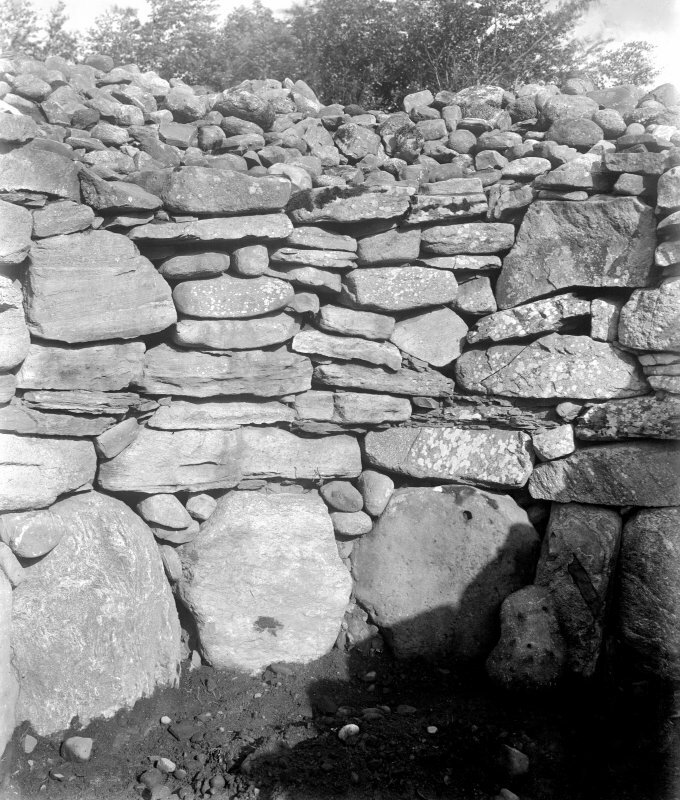 The cairn material is now piled up inside the kerb and reaches a height of nearly 10 feet. There is a distinct platform of stoney material, rather irregular in outline, extending for 10 to 18 feet beyond the kerb and having a depth of about 1 foot 6 inches. The passage is constructed of large boulders. 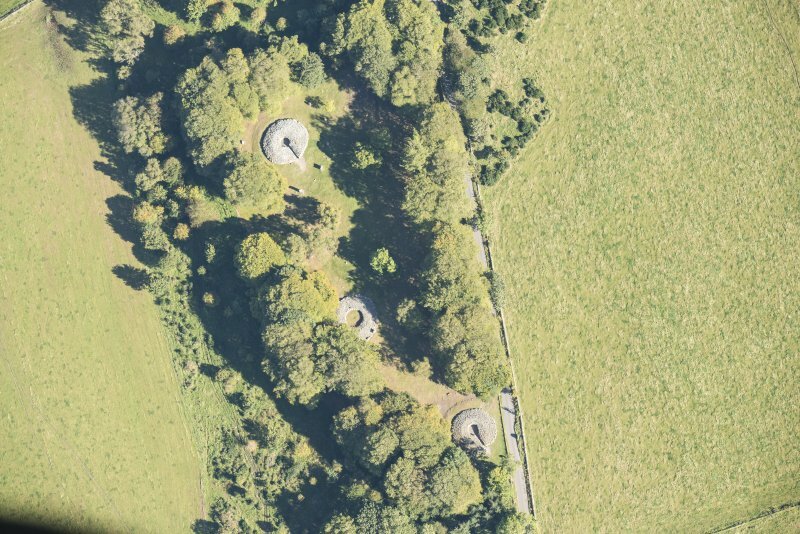 The chamber has a diameter of 12-13 feet. 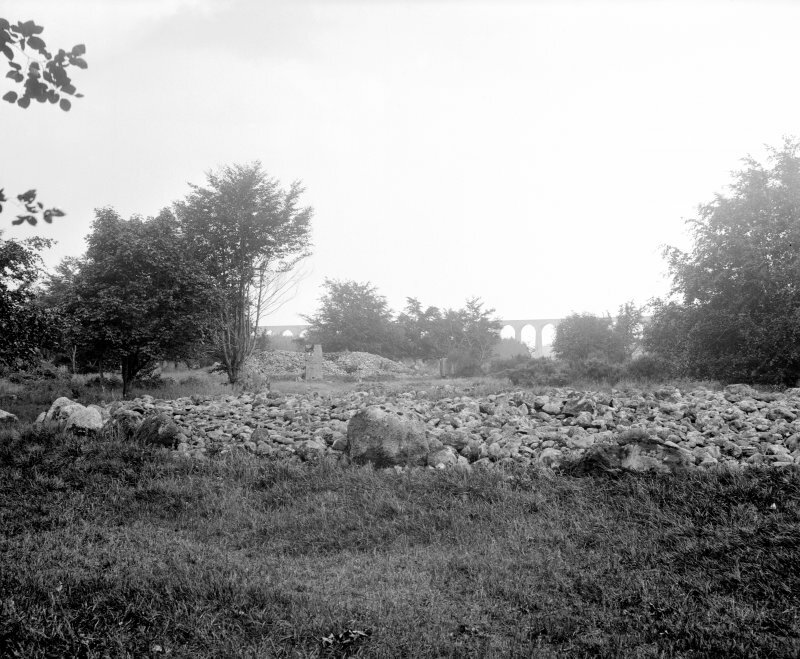 The lowest course is also of upright boulders, those by the entrance 3 feet 9 inches and 3 feet high, those at the back 2 feet 5 inches high. 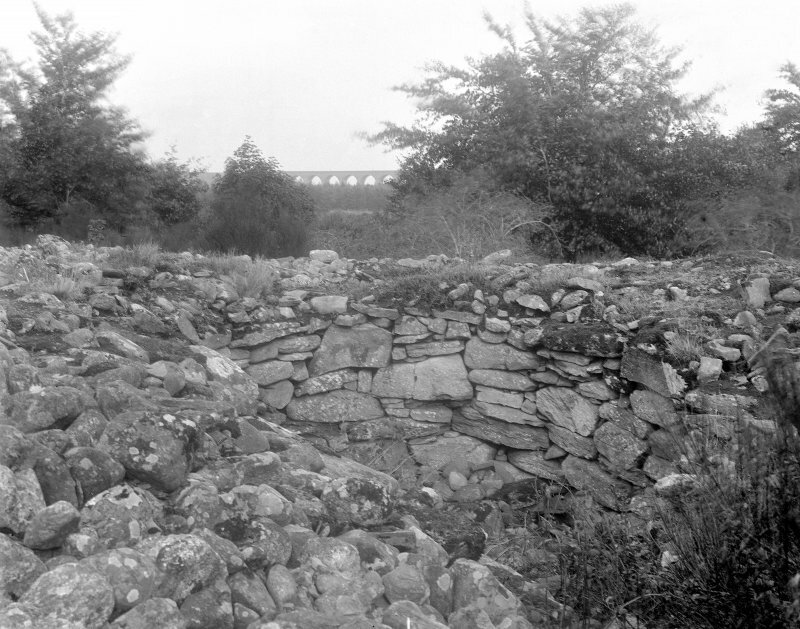 The wall at the back still remains up to 7 feet high consisting of eight rough and irregular courses including some very large stones. There is only a slight oversailing of the upper part giving a maximum overhang of 1 foot. 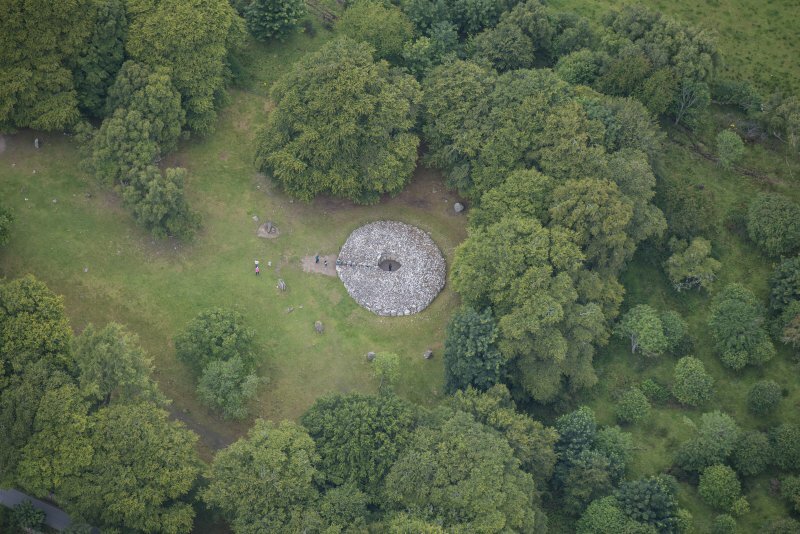 The cairn is surrounded by a circle of eleven standing stones (and one small earthfast stone on the north-north-east). The stones are irregularly spaced and vary from 24 to 37 feet from the kerb having an overall diameter of 110 to 117 feet. This irregularity is probably partly due to the fact that some of the stones (those on either side of the entrance, and the next stone to the north and north-east stone (W Jolly 1882) were reset in the 19th century. 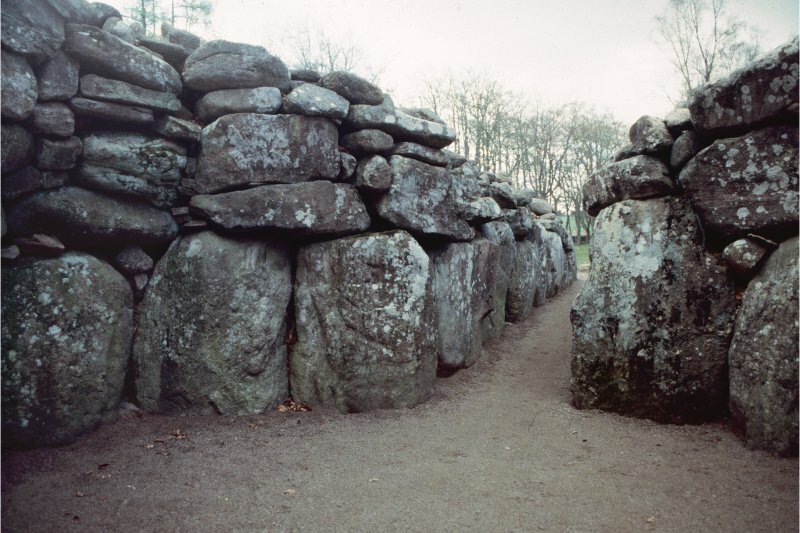 The two stones on either side of the entrance one 9 feet and 5 feet 3 ins. high. 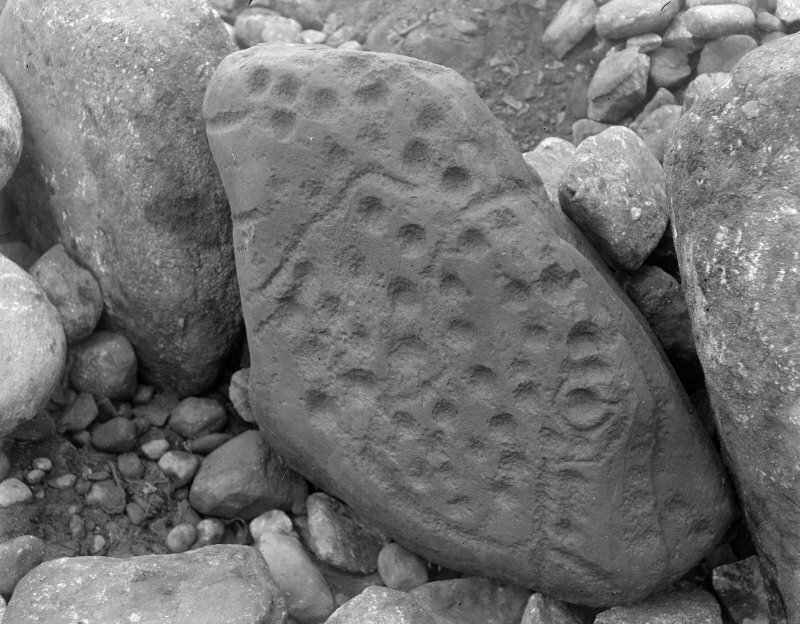 Cupmarks occur on the innermost stone of the passage on the north-west side (W Jolly 1882) and also on a stone on the north side of the kerb (S Piggott 1956). 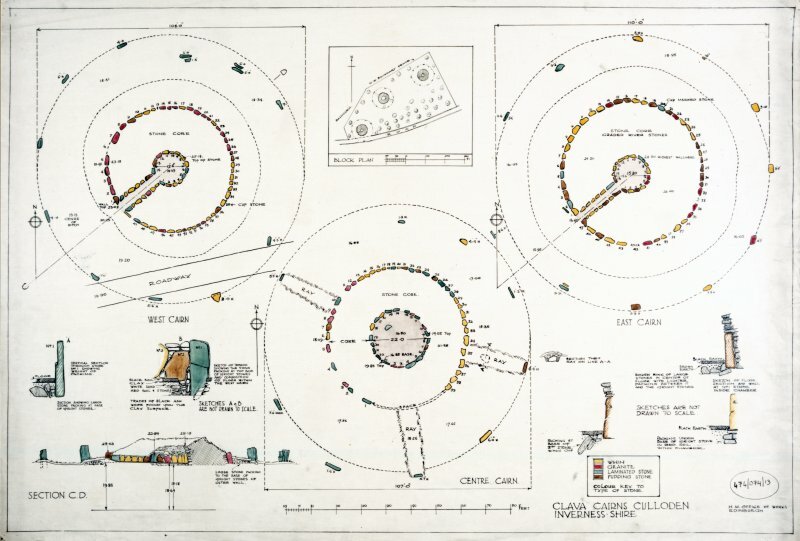 The former stone has certainly four and possibly seven simple cups; the latter, which measures 2 feet 8 inches by 1 foot 5 inches, is covered with cupmarks, one cup and ring meandering lines. A S Henshall, Visited 15 April 1957; W Jolly 1882; J Fraser 1884; C Innes 1862; S Piggott 1956. NH 7576 4447 The remains of this cairn are as described above. Visited by OS (W D J) 25 April 1962. 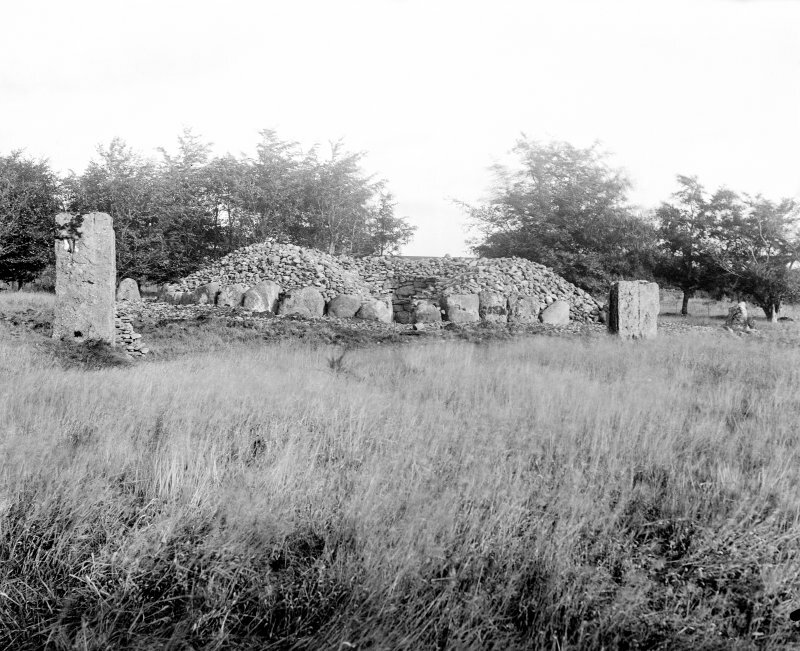 Air photographs of the Balnuaran of Clava cairns taken by Jill Harden in 1989, are in Inverness Museum (8901.21-22 and 8907.02 INVMG). Information from J Harden 1989. 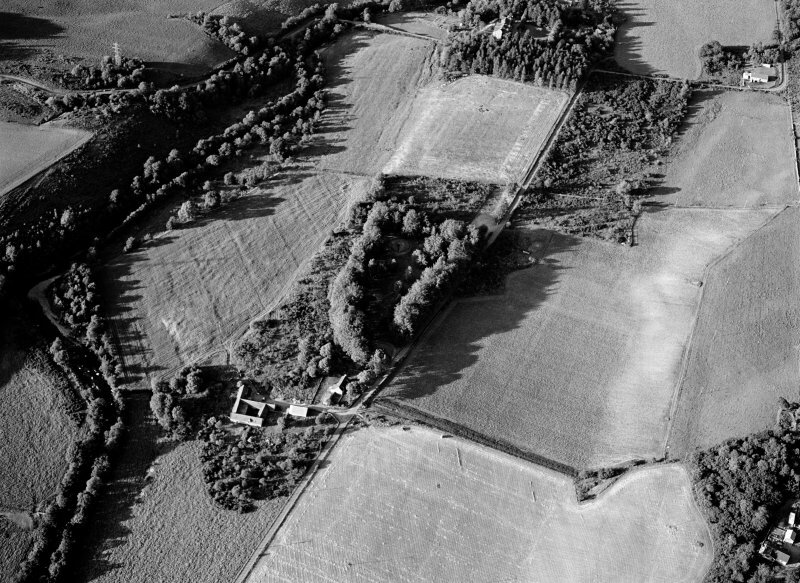 NH 7576 4447 The second season of excavation (see Bradley 1994) focused on the NE passage grave and investigated the chronological relationship between the five main elements on the site: the internal structure of the cairn, its kerb, its entrance passage, the platform upon which the site appears to be built and the stone circle which surrounds the entire monument. All proved to have been constructed during a single phase. 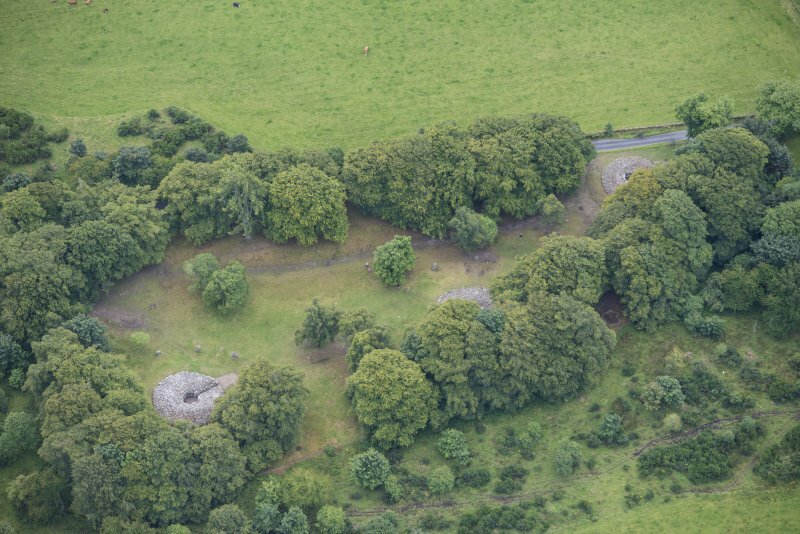 The cairn contained a core of massive blocks and redeposited turf or topsoil which formed a stable structure supporting the corbelled burial chamber. This was covered by a skin of smaller rubble which was revetted by the kerbstones. 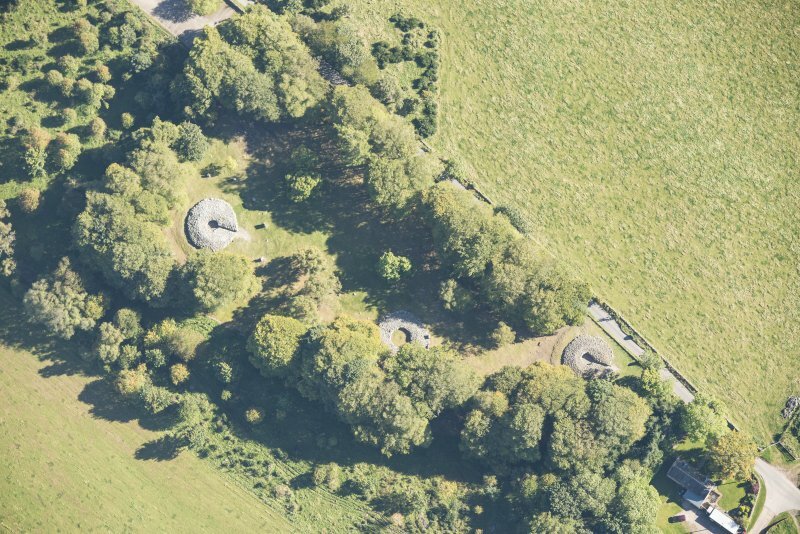 These were only shallowly bedded in the ground and had been held in position by a rubble ramp piled up against the exterior of the monument. 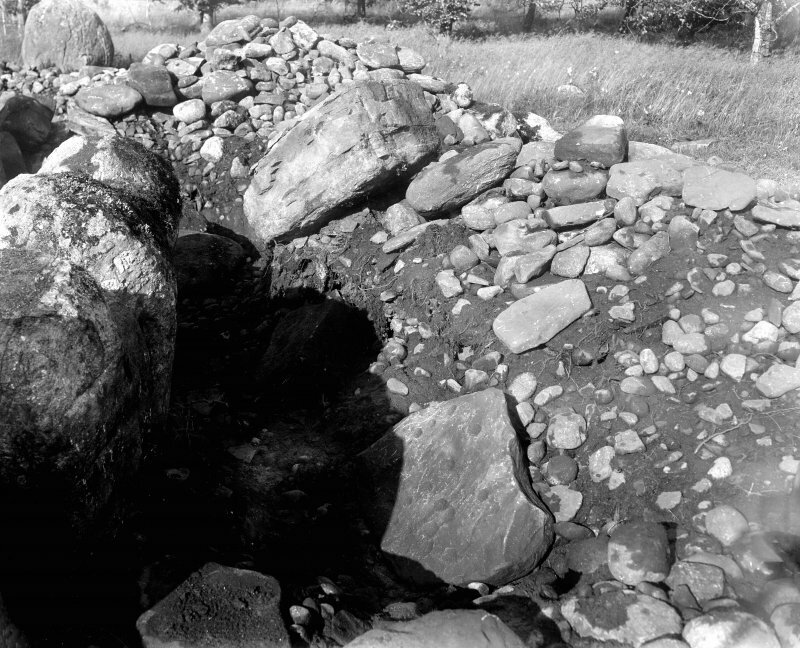 The composition of this ramp or platform matched the constructional sequence in the cairn itself, with quarried slabs similar to those employed in the chamber towards the base of this deposit and rounded boulders towards its surface. 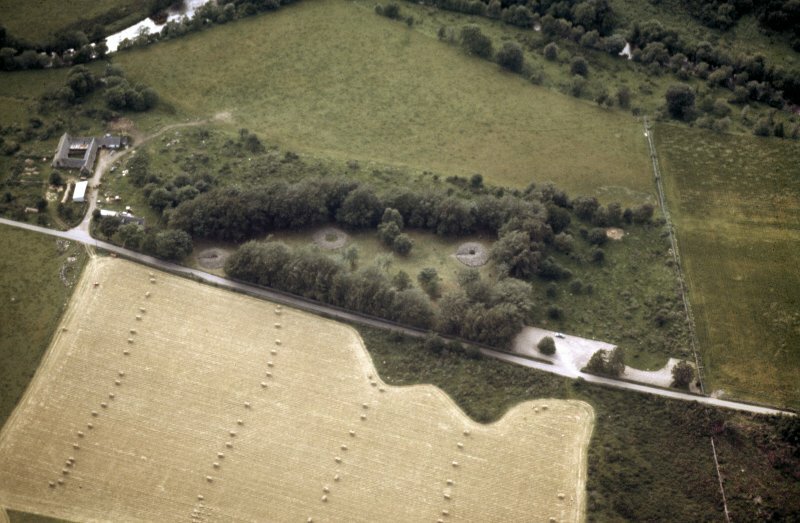 This feature continued unbroken across the entrance to the tomb and extended outwards as far as the stone circle. 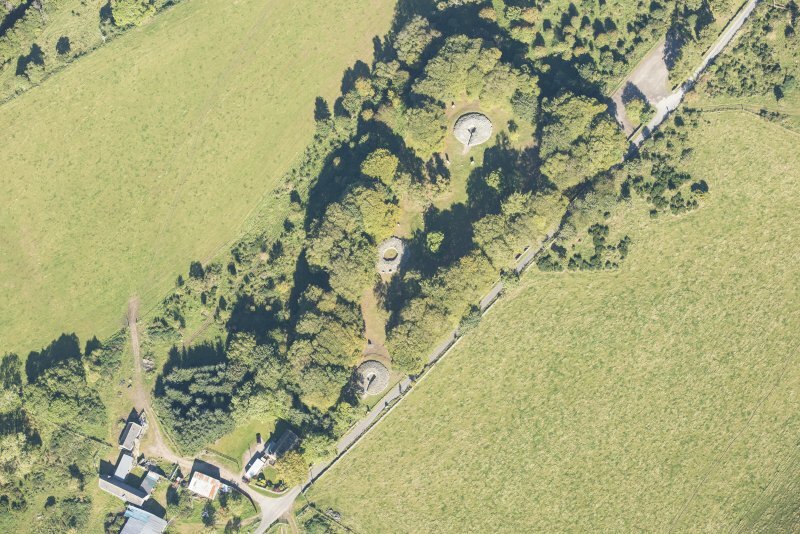 One of the monoliths belonging to this circle lacked any socket and was bedded in the tail of the ramp- thus it could not have been erected after that material was in position. The entrance passage had been cleared of any archaeological deposits during an unrecorded excavation. A few flecks of cremated bone were found on the surface of the platform. Over a hundred lithic artefacts were recovered during the excavation and samples were taken for study by soil micromorphology, pollen analysis and radiocarbon dating. 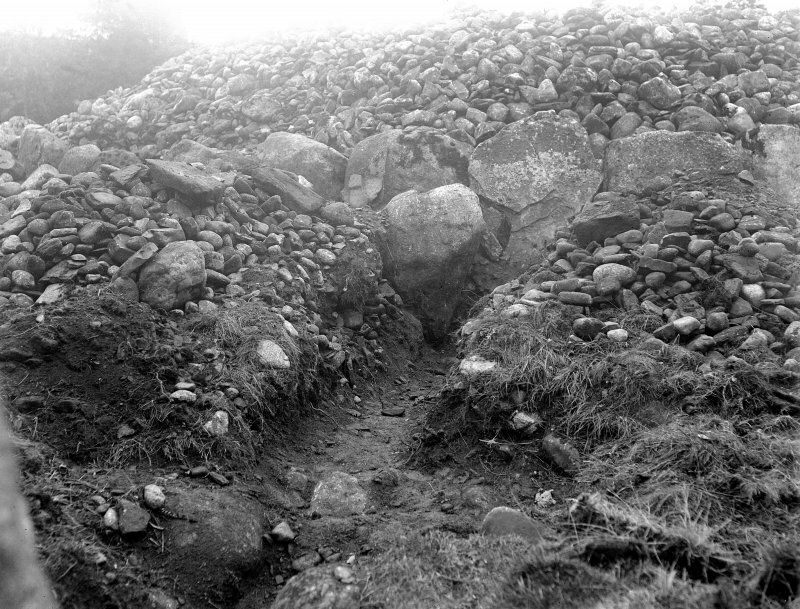 A section was also cut through the rubble ramp of the SW passage grave (NH 7568 4447) (NH74SE 4) at the point where the kerbstones were at their lowest. 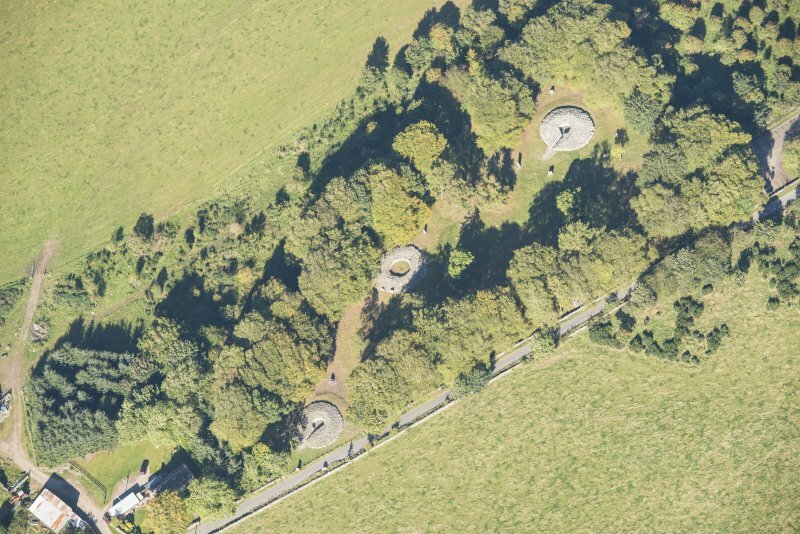 In this case the kerb lacked any sockets and again the ramp must have been a primary feature of the monument. 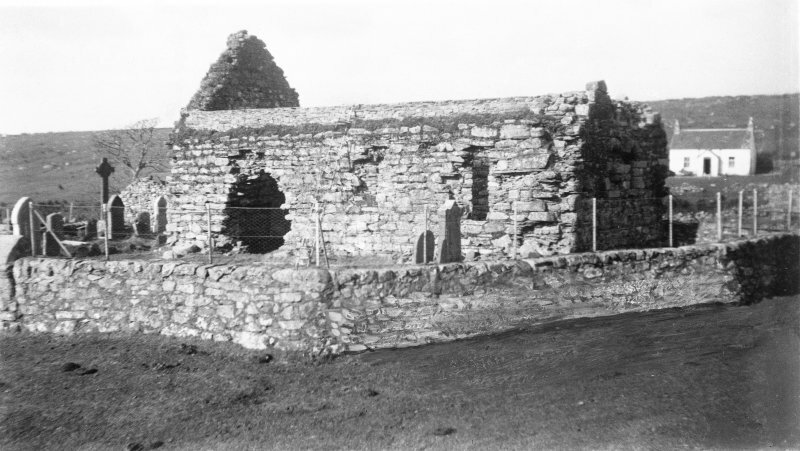 It was constructed in exactly the same manner as the platform of the NE cairn, but in this case it had been surfaced with flat slabs. 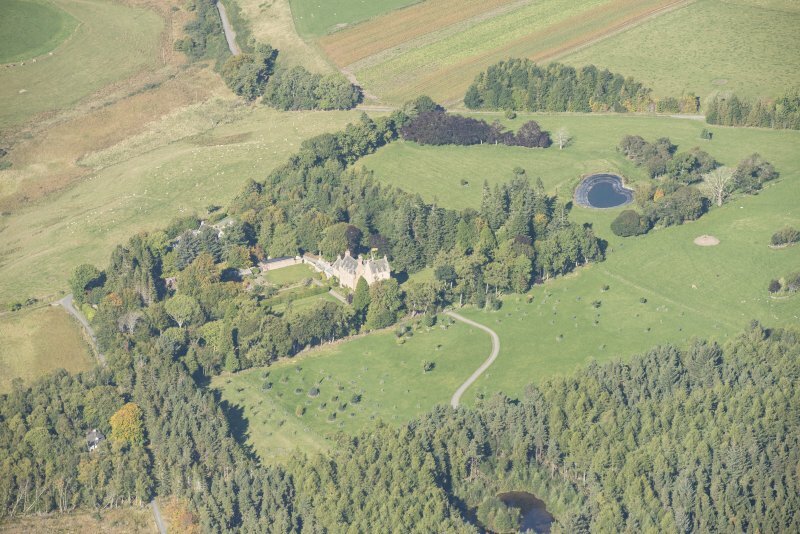 Sponsors: British Academy, Historic Scotland, Reading University, the Society of Antiquaries of London and the Society of Antiquaries of Scotland, with additional assistance from Highland Regional Council and National Trust for Scotland. 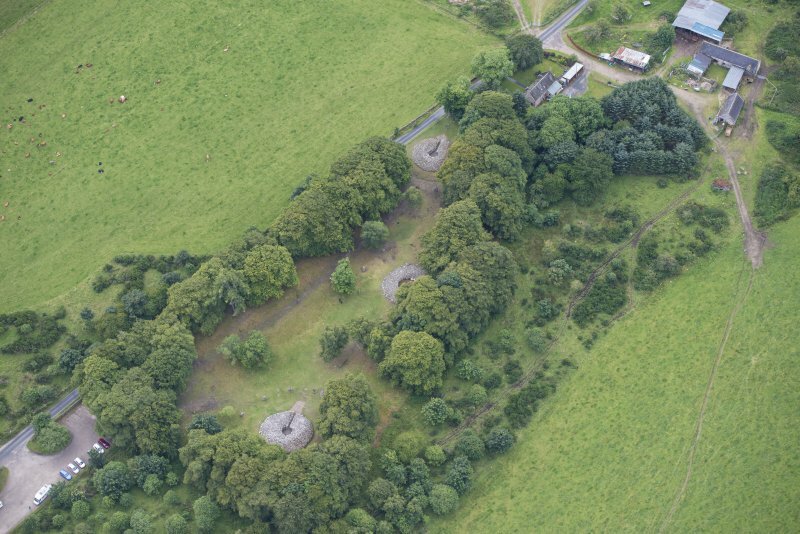 Three impressive round cairns, each surrounded by a ring of standing stones, are now fenced off within a wooded enclosure. They have given their name to a whole group of similar burial cairns found only in Inverness and Nairn Districts and in the Black Isle. 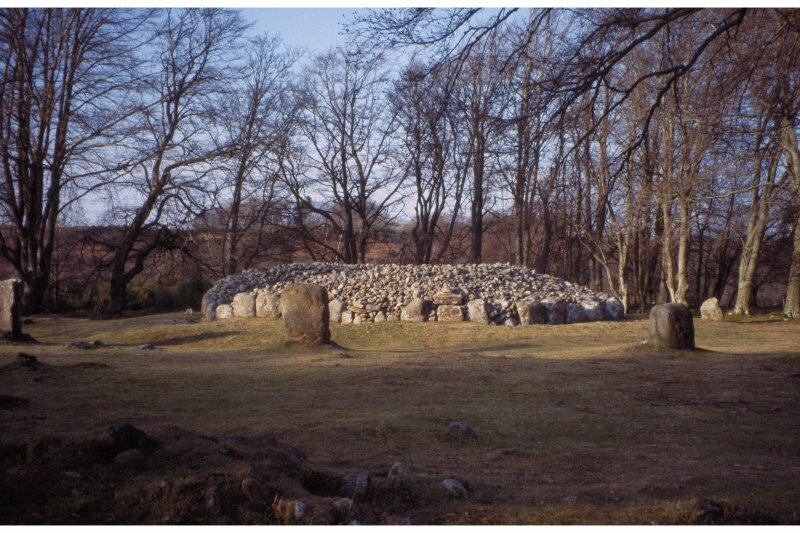 The three cairns at Clava are set in a line, the central cairn being a ring cairn while the other two, known as the NE and SW cairns, are passage graves. All have been dug out at different times without proper record. 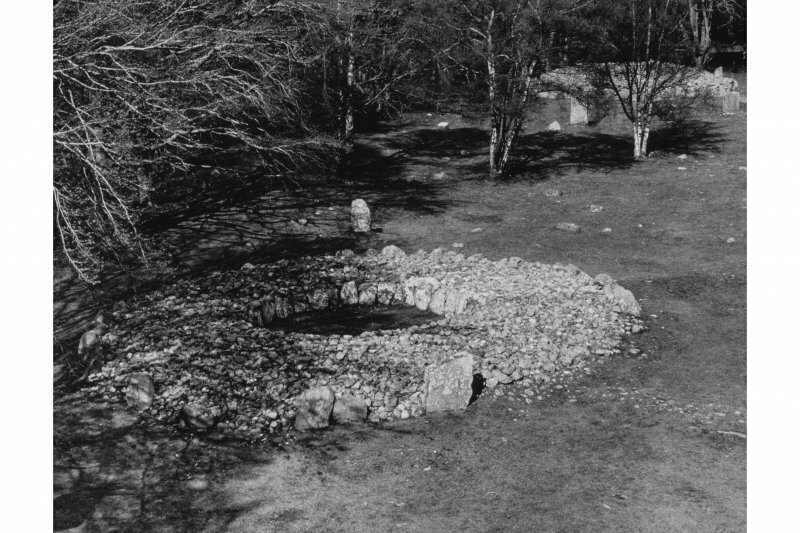 The ring cairn at Clava was dug by modern methods in 1953, but owing to previous distu rbances little was found except some scraps of cremated human bone. 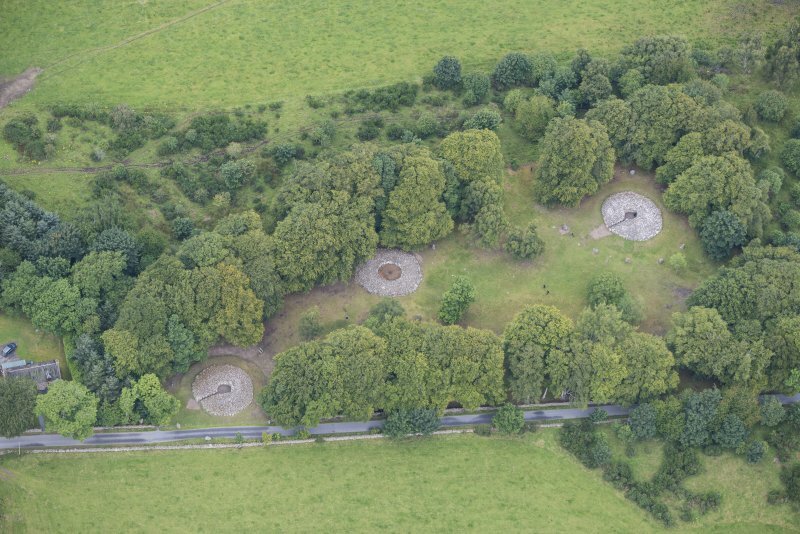 As seen today, the cairns are open in the centre, but they would not have been like this originally. 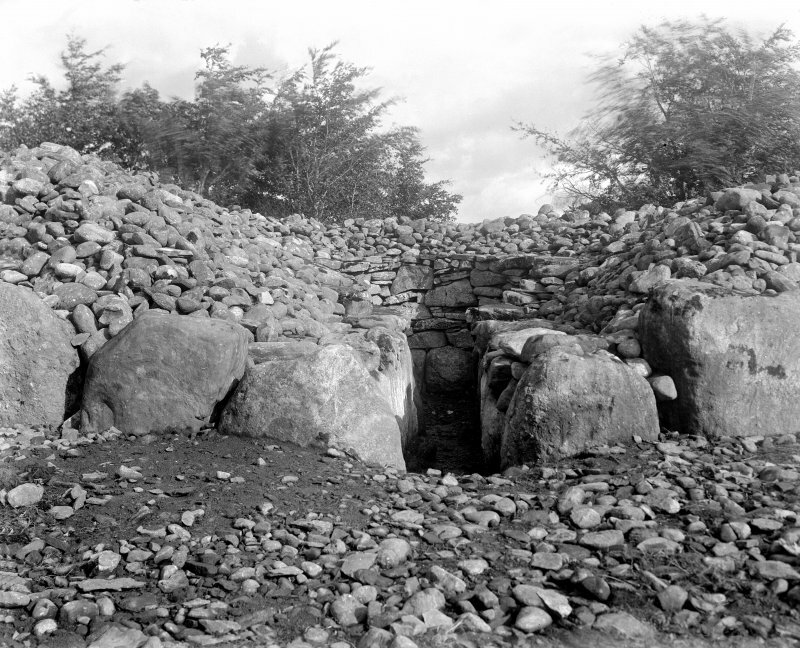 The chamber walls of the passage-graves would have been corbel led inwards until the gap could be covered with one large capstone, the passages roofed with flat slabs and then the whole structure covered with more stones, so the cairns would have been 3.10m high or more, while the ring cairn, which has no passage, and has a larger central space, is thought to have been filled, after burial, with earth and stones up to the top of the surrounding walls. All the cairns have a graduated kerb with larger boulders near the entrance on the southwest side. 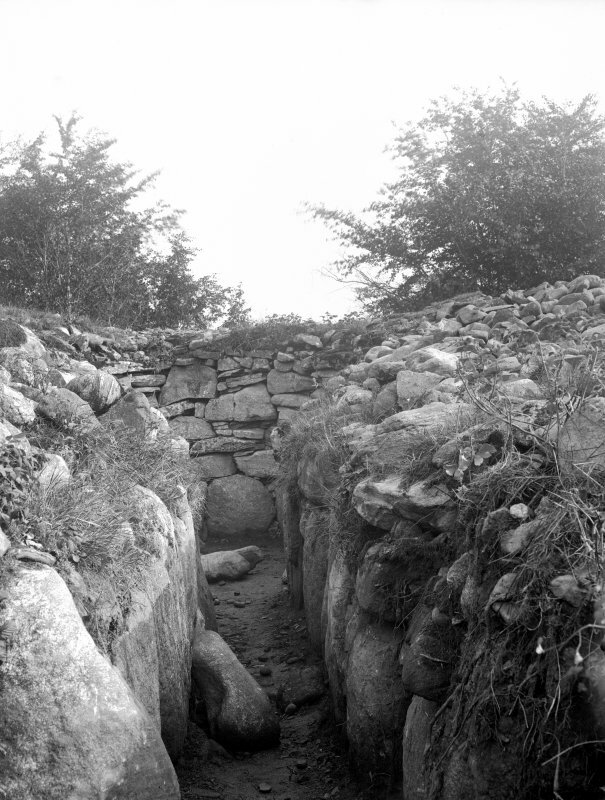 The passages and chambers are lined with slabs, graduated in the chambers, and carrying upper courses of drystone walling. 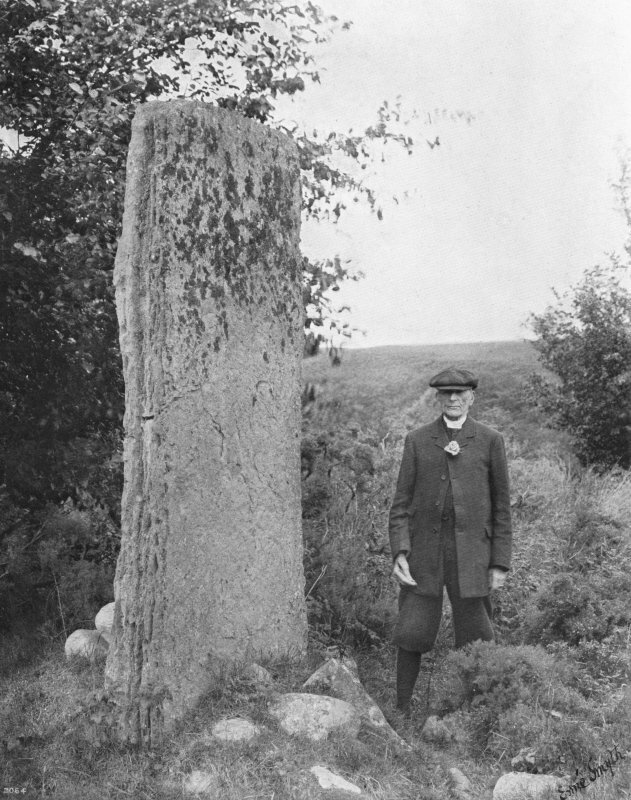 Round the cairns are set circles of standing stones, varying in number, but having taller or more impressive stones on the south or southwestern side. The modern road curs between the SW cairn and part of its circle of stones. 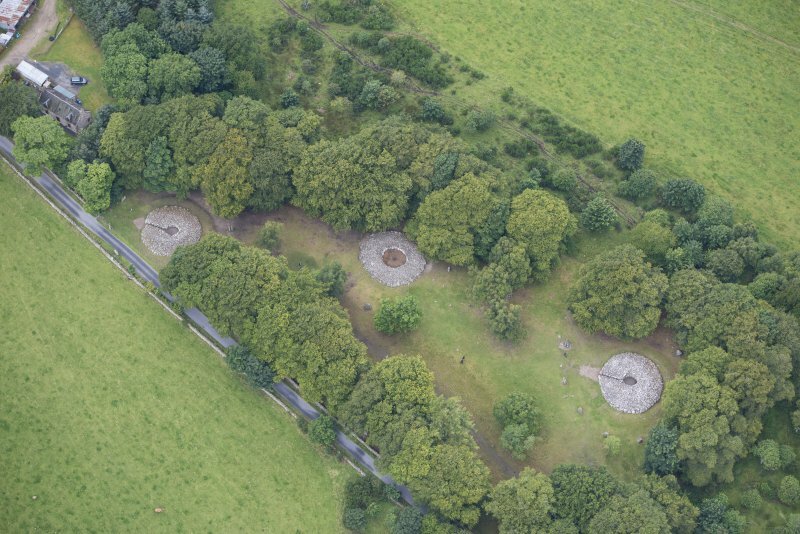 Unique features of the three cairns at Clava are the low stone platforms surrounding the cairns, and the cobbled 'causeways' linking the platform round the ring cairn to three of the standing stones. 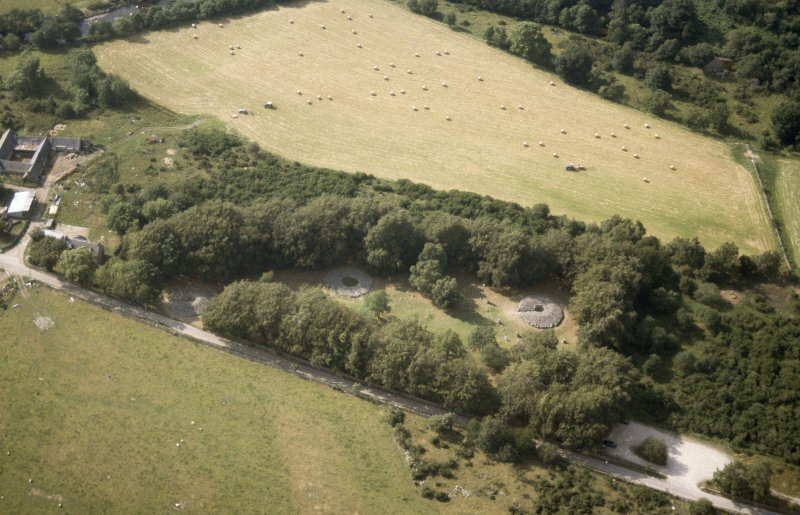 Excavation in 1994 showed the causeways to be contemporary with the ring cairn and its stone circle. 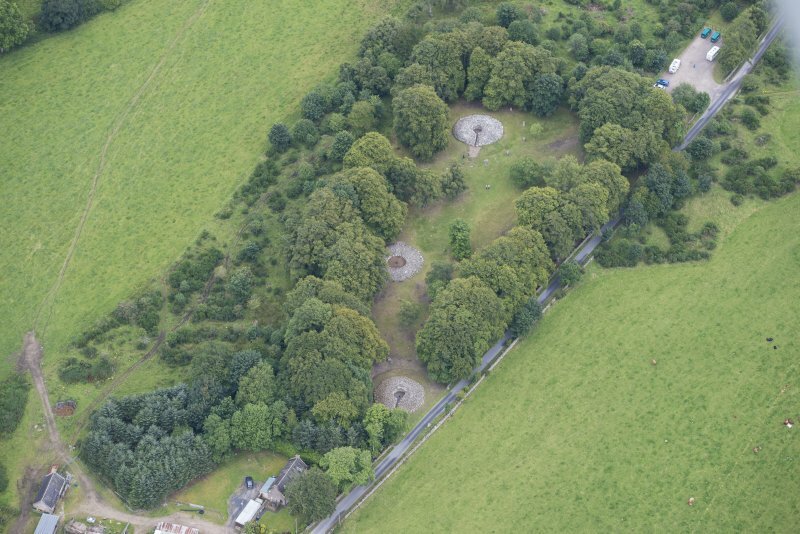 Several stones in the cairns have cup-marks made before the stones were set in place; the clearest are those in the NE cairn (nearest to the car park) which has cup-mark s on the innermost lefth and slab in the passage, while a fin e cupmarked boulder with a ring round one cup is set in the kerb on the north of the same cairn. 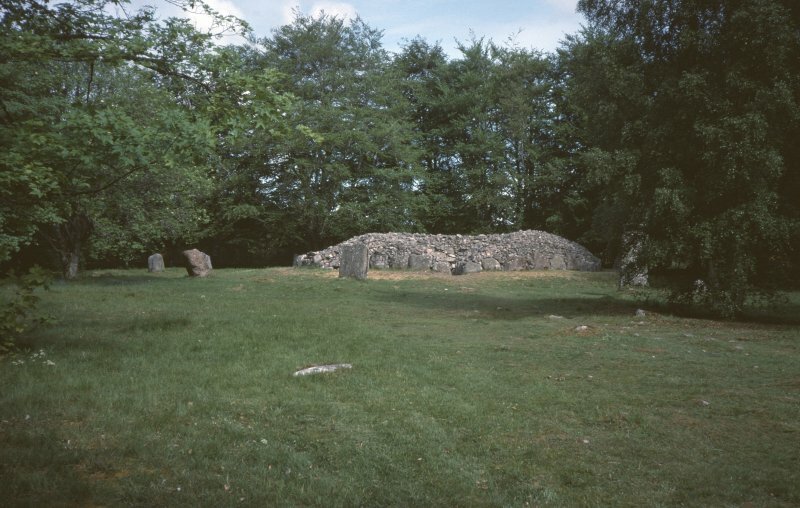 Just west of the central cairn, against the fence, is a smallring of stones 3.7m in diameter. This may be the surviving kerb of a late type of bronze-age cairn known as a kerb cairn, where a low cairn generally covered a cremation burial within the kerb. 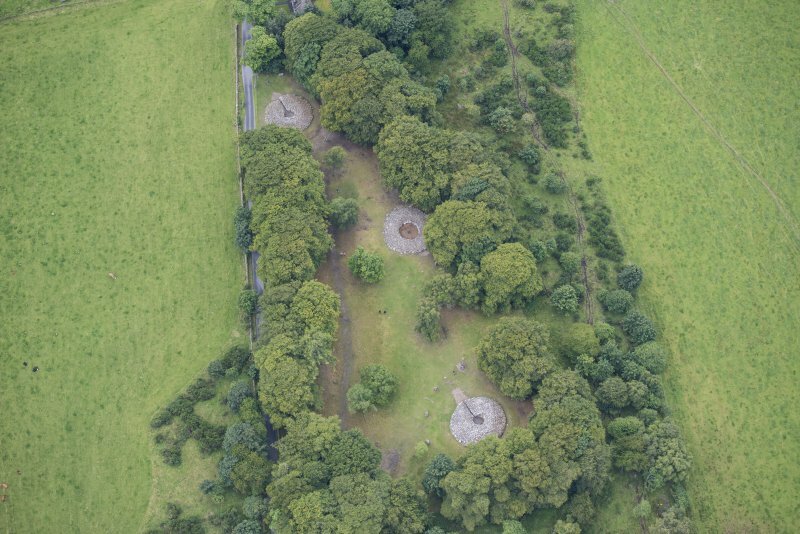 NH 75 44 Earthwork survey identified the remains of a circular mound 13m in diameter situated roughly midway between the NE cairn at Balnuaran of Clava and Mains of Clava North. 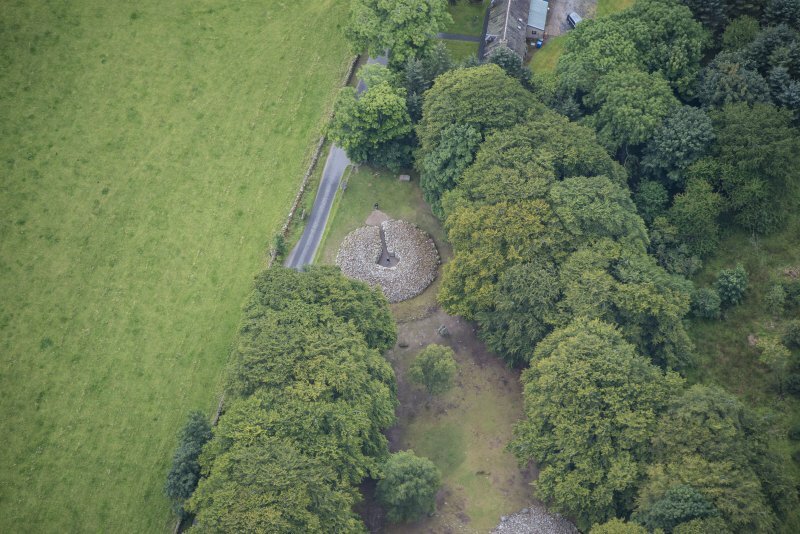 At least half the mound had been destroyed by ploughing but its lowest levels survived beneath a field wall built during the 19th century. 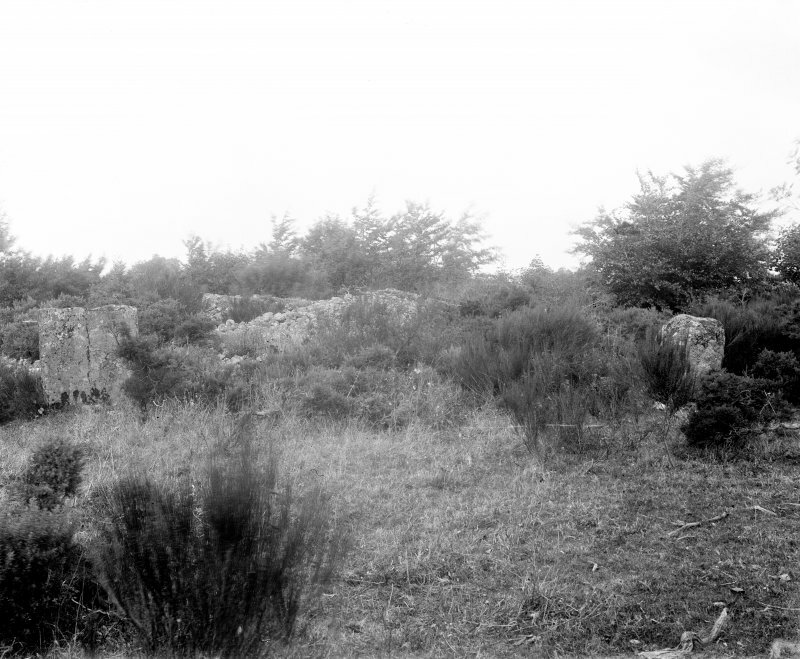 There were a number of unusually large stones in the wall at this point, suggesting that this may have marked the position of another megalithic tomb. Sponsors: Historic Scotland, Reading University, with assistance from Highland Archaeology Service. 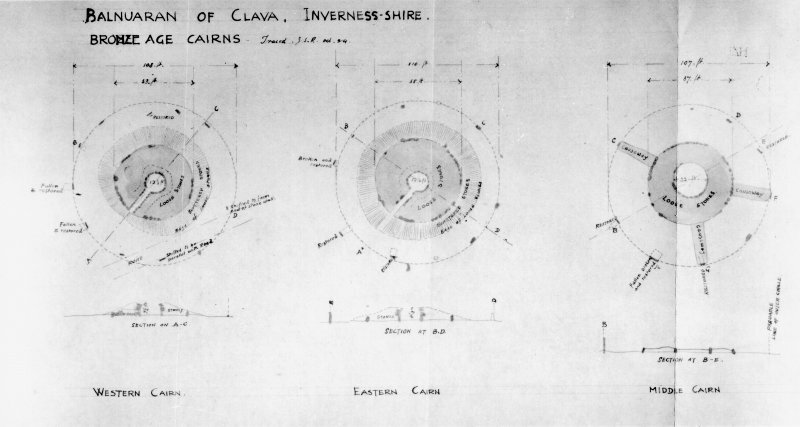 A watching brief was carried out by CFA Archaeology Ltd within the Scheduled Monument of Clava Cairns, Highland. A tree bole from a fallen tree was cleaned by hand and inspected prior to removal of the tree by a tree surgeon. 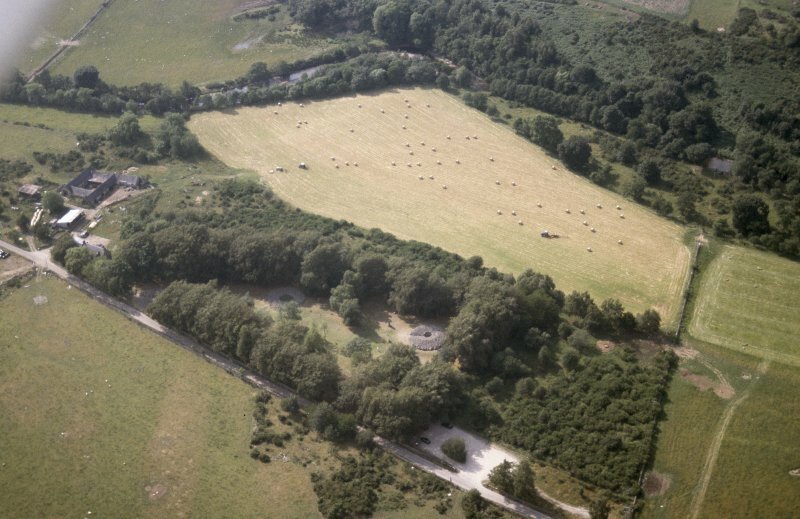 No features, deposits or artefacts of archaeological significance were identified.